The California redwoods and sequoias – a photographer’s dream to photograph. 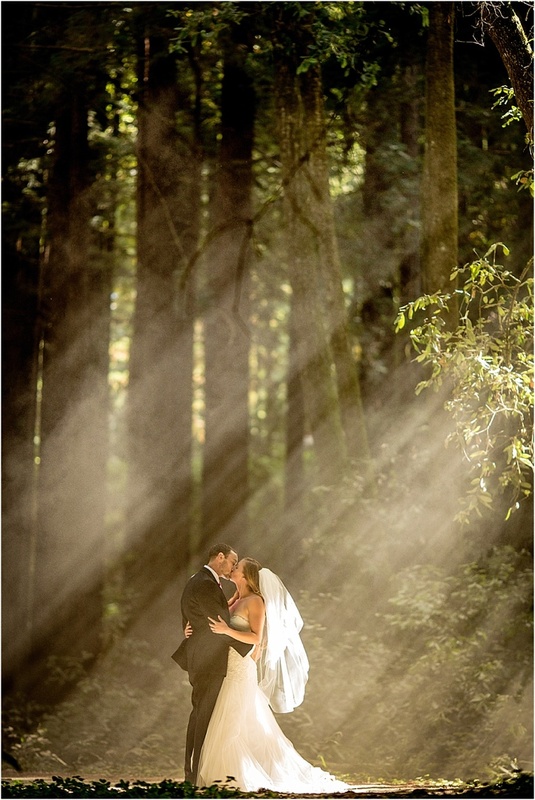 When I talked to Kat and Tim about their Aptos wedding, and she told me about the Forest of Nisene, I may have done a happy dance in the car. Not only was the wedding being held in the forest, but it was on a trail Kat grew up hiking, and at a fairy circle (where the base of the trees begin to grow together, creating a circle enclosure). My amazing secondary photographer (the awesome Molly) and I drove straight to Aptos after arriving at Santa Cruz, arriving to see the amazing light falling through the trees and onto the forest floor. I knew that Kat had a surprise first look planned for Tim, but to actually see the T-Rex costume idea unfold was probably the hardest I’ve ever laughed behind the camera. To say that their day was full of love and laughter would be a gross understatement. Kat and Tim’s handwritten vows to one another were incredibly heartfelt. I try my hardest to remember the small moments during ceremonies that touch my heart – and Kat talking about the reasons she chose Tim really tugged at my heartstrings. She said something that I’ll never forget – that relationships are a choice. And how true that statement is, and seeing two people choose each other, to commit themselves (for life!) is a big moment. It can be easy to forget how large that moment actually is, and that you should remember to embrace it. Kat and Tim had a wedding that was truly about the two of them creating a union, and not about the fluff that can sometimes pop up in the wedding industry. The emotions were so raw, so real, that Kat and Tim both reached for a comforting smooch mid ceremony. After their touching ceremony, I got to see the fun loving side of Kat and Tim. One of the “traditional” things Kat and Tim didn’t want for their Aptos wedding was a bridal party – but they did want fun photos with their loved ones. All of their friends felt like family, and all of their family were so genuinely happy to be there celebrating. I’m a firm believer that things unfold a certain way for specific reasons. Call it fate, call it the cosmos, call it ol’ fashioned luck – but whatever your choice word is definitely was the case for Kat and Tim’s Aptos wedding. We originally were set to do all of their couple’s portraits before the ceremony, but as with many weddings, things were slightly behind, leaving us to finish our couple’s portraits after the family portraits. As we were finishing up our time in the forest and getting ready to head back to their reception, the sun fell lower into the horizon and began streaming through the trees. I saw the streams of light, and immediately knew this was why everything was pushed back – so we’d be able to catch this amazing, awe inspiring light. As we walked up onto the road, some dust caught the light and gave me the idea to have a car kick up some dust for us. The first attempt was a dud, and I thought my idea was bunk. But if at first you don’t succeed, try asking someone with a 4WD vehicle instead of the tiny Nissan to burnout on the dirt road. 😉 Once the truck passed and kicked up dirt – the amazing, beautiful dirt – Kat and Tim ran out (quite literally) into the road to get some of my very favorite images to date.